A member of the Oakland University Athletic Hall of Fame after a stellar collegiate swimming career at Oakland University, is co-owner and co-head coach of Cardinal Aquatics. One of the most outstanding female swimmers in the history of the Oakland University program, Albiero is among the elite nationwide in her sport. While at OU, she earned 27 all-American honors, was a 12-time national champion, the 1992 NCAA Division II Swimmer of the Year and was an NCAA record holder in three events. Albiero was a member of four NCAA Championship teams during her four-year career at Oakland -- 1991, 1992, 1993, 1994. Individually she was a five-time champion, winning three titles in the 100-yard backstroke and one each in the 200 backstroke and 200 individual medley. The Bellville, Ohio native set the NCAA Division II record in the 100-yard backstroke (55.49),which still stands to this day, and was a part of the record setting 200-yard medley and freestyle relays. Albiero also holds the school records in the 100-yard backstroke (55.49), the 200-yard backstroke (2:01.26) and the 200 individual medley (2:05.99). She was also a part of the school record setting 200 and 400-yard medley relays and 200-yard freestyle relay.A psychology (exercise science) major, Albiero graduated from Oakland University in 1995 with a bachelor’s degree in Arts and Sciences. 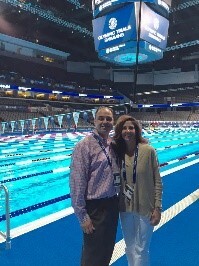 Albiero is married to University of Louisville’s head swimming and diving coach Arthur Albiero. They have three children: Estefan, Nicolas and Gabriela. 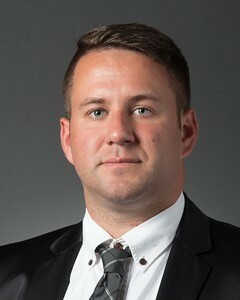 Stefan is on his three season as a member of the coaching staff at the University of Louisville. He acts as Coach for the Cardinals and as the Event Coordinator for the TYR Derby Pro Swim Meet. He also coached the last three season the pro-group (Kelsi Worrell, Joao Delucca, Carlos Claverie, Grigory Tarasevich under Arthur Albiero Head Coach of University of Louisville and Team USA head coach. Before he spent the last three years as recruiting coordinator for Delta State University swimming and diving after previously being a member of the team. During his time at Delta State, he was a three-time NCAA finalist and was a three time All-American. As a coach, he helped the Statesmen and Lady Statesmen to win three conference trophies. He also coached 35 athletes over the last two seasons to Division II nationals for the best finish for the Lady Statesmen in program history. The women finished ninth last year 9th and the men were 11th at the Division II NCAA in Indianapolis, Ind. Overall, there were 40 school, conference and pool records broken in the past two years. Prior to his stint at Delta State, Lackner amassed extensive international experience and gathered a list of accomplishments. He participated at the Youth Olympic Games, Youth European Championship Games, World Cups, German and Austrian Nationals. In 2003, Lackner was a national champion in open class in his native country of Austria. He won eight junior national titles and twelve age group titles. Lackner also competed in numerous events around Europe for his club team SG Bayer, Germany - a club team that provided the opportunity to train with some of the best swimmers in the world. "I had the true honor to swim with the best, Thomas Rupprath, Steffen Driesen and Sarah Poewe were only a few of the Olympic, world and European medalists that were a part of that team. I had one of the greatest coaches, Henning Lambertz, who was not only a coach but a very good friend and mentor. He taught me not only swimming, but what it takes to be a professional athlete and the responsibility that comes with it. "Henning Lambertz is currently the National Head Swimming Coach for Germany. Between the years 2009-11, Lackner finished his professional career under coach Michael Lohberg in Coral Springs, Fla. "I learned a lot from Michael in those years. He gave me the support I needed at that time, and through his background had a lasting impact on me. He was for me, and still is one of the greatest coaches of all time,” said Lackner. Lackner graduated from Delta State University with a Bachelor's and Master’s degree in business. He is also ASCA and USA Swimming certified. João has become an important top world Brazilian swimmer in the recent years. In the last years João was able to make a name for himself doing what he loves most. From 2011 to 2014 he had the honor and responsibility to represent the University of Louisville as a D1 college swimmer. At the University of Louisville, João contributed to the improvement of the program on the water by achieving new records and medals as well as off the water through his leadership and ability to motivate others. 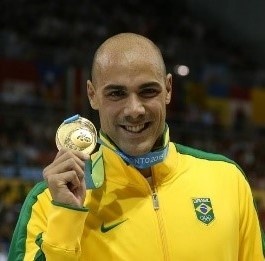 In his short career, João has been awarded several international medals and has participated in world renowned competitions such as the London and Rio Olympics. In the past years of experience, João has acquired knowledge in several techniques and has learned to focus and strengthen his mentality to utilize it in competitions, conditioning and training. Currently, João lives in Louisville, KY with his wife, Carol, and their dog, Lua, where he coaches Cardinal Aquatics and continues training for Tokyo 2020. Worrell swam to a ninth place finish in the 100 Fly, just missing the Championship Heat. In the 4x100M Medley Relay, Worrell helped the USA win the Gold. On day one of World Championships Worrell helped Team USA (Comerford, Manuel & Ledecky) to a new American record in the 4×100 freestyle relay–3:31.72. Worrell split a very strong 53.17 on the second leg. 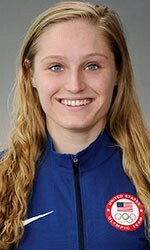 Worrell followed up with a 2nd Worlds medal, bronze, in the 100m butterfly, swimming a new personal best, 56.37. Lucy Kramer was born April 24th, 1994, to Craig and LorieJo Kramer, she grew up in Carmel, Indiana prior to joining the University of Louisville’s swimming and diving team where she received her Bachelor of Science in Health and Human Performance, with a concentration in Public Health Education. Lucy came to Louisville for school in 2012 and fell in love with the city. Lucy grew up participating in a variety of different sports; from soccer to dance and tennis to gymnastics, until she finally decided to give swimming a try. Lucy has been a water bug her entire life but it wasn’t until she was 7 years old that she developed a true passion for the water. She started out swimming at her local YMCA for fun when one day, Meg Osborne, “discovered” her and insisted she try out for her club team. After swimming for Meg for a couple of years Lucy moved to Carmel, IN and started her journey, which lead to swimming for the University of Louisville. Lucy worked her way up to her current position as Aquatics director by first taking on the role as the Assistant Aquatics director of the Norton Commons YMCA. Lucy has a passion for swimming and is very excited for what is to come on her continued journey in the swimming world.